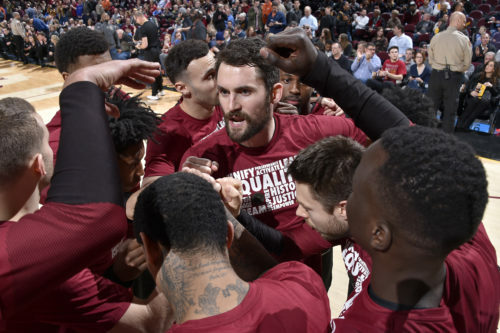 The Kevin Love Fund strives to inspire people to live their healthiest lives while providing the tools to achieve physical and emotional well being. After publicly sharing his own battle with anxiety and depression, Kevin became committed to normalizing the conversation around mental health, opening up the public discussion and empowering people to pursue mental wellness with the same vigor as they do physical health. Early beneficiaries of the Kevin Love Fund include Bring Change to Mind, created to end the stigma and discrimination around mental health by empowering young people in high school and college; the Just Keep Livin’ Foundation, founded by Matthew and Camila McConaughey to empower high school students to lead more active lives and make healthy choices; and the UCLA Athletics Department, which influenced Love heavily during his time there as a student and athlete. The Kevin Love Fund has also aligned with the meditation and mindfulness app Headspace as a strategic partner to support their vision of improving the health and happiness of the world. Together, the two have already provided student athletes at UCLA with year-long subscriptions to the app to incorporate into their training regimens. Learn about the other artists, athletes and influencers who trust EIF to expand their footprint in philanthropy and leverage their platforms for social good. Founded in 1943, the Entertainment Industry Foundation (EIF) is a multifaceted organization that occupies a unique place in the world of philanthropy. By mobilizing and leveraging the powerful voice and creative talents of the entertainment industry, as well as cultivating the support of organizations (public and private) and philanthropists committed to social responsibility, EIF builds awareness and raises funds, developing and enhancing programs on the local, national and global level that facilitate positive social change. EIF is a 501(c)(3) tax-exempt organization and meets all 20 BBB Charity Standards. Copyright ©2019 Entertainment Industry Foundation. All Rights Reserved.